The Evenflo Sureride DLX is a great choice for any family. Whether you’re looking for quality, style, or affordability, this car seat really has it all. 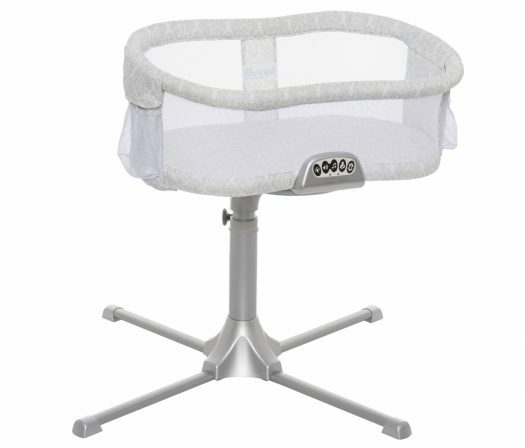 And to top it off, it provides maximum comfort for your baby or child. The MSRP lands below $100 and for a convertible car seat, that’s worth the price tag. It’s lightweight enough to move around with ease. The seat design is almost too deep, especially for rear-facing. Because it’s lightweight, it seems less durable. When rear-facing, it takes up a lot of room. Why the Evenflo Sureride DLX is safety and style you can afford. The Evenflo Sureride DLX car seat uses Evenflo’s Side Impact Test Standard for Structural Integrity, which uses energy levels that are roughly two times the Federal Crash Test Standard for car seats with multiple shoulder harness positions. What that means is that not only is the car seat tested for overall safety but that it exceeds the necessary safety precautions. Rollover testing simulates a roof-to-ground car accident, while the aircraft testing ensures that the car seat meets the requirements set by FAA Inversion in order to secure a baby in their car seat while in the air. Side impact testing with the Evenflo Sureride DLX car seat tests makes sure that it meets or even exceeds the federal standards for side impact instances in a car accident. As previously mentioned, the Evenflo Sureride DLX is made to fit babies starting at infancy. In this case, that would be five pounds. In the rear-facing position, babies are required to be 5 to 40 pounds and 19 to 40 inches tall. Then, when you switch to forward-facing, your baby should be 22 to 65 pounds and 28 to 54 inches tall. …is made to fit babies starting at infancy. When the car seat switches to forward-facing, it can still be latched to your back seat or buckled through the back, but the Evenflo Sureride DLX doesn’t require you to run the seat belt across the front of the car seat. Having a car seat that’s more of a hassle to install isn’t exactly a deal-breaker for some, but having one that’s easier can definitely be a plus. Without the need for a base to lock the car seat into, the Evenflo Sureride DLX car seat is easier to install and weighs 23 lbs with a capacity of 65 lbs. 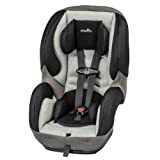 Instead of worrying about latching and installing a base in each car your baby will ride in, you can install the car seat with either the latch system or seat belt. And then unlatch either of them when you need to move the car seat to another car and repeat the process. This does away with the necessity of purchasing multiple car seat bases to be kept in separate cars or to be taken in and out ad nauseam. Sometimes, having a car seat base gives parents peace of mind, but with the safety qualifications of the Evenflo Sureride DLX, that’s not something you’ll have to worry about. …weighs 23 lbs with a capacity of 65 lbs. The Evenflo Sureride DLX car seat features six different harness adjustments, as well as a harness adjustment in the front of the car seat. And there is not one but two buckle positions. The front harness adjustment makes it possible to adjust your baby’s harness straps while they’re still in the car seat, as opposed to taking the entire car seat out and trying a trial and error scenario in trying to figure out the most comfortable and safe position. If you’ve ever tried to squeeze a 50-pound toddler into a car seat with the same buckle position that they used at 15 pounds, then you know how very real the struggle can be. But not only that, it can also be super uncomfortable for your kid. So having two different buckle positions, while it may seem like a minor detail, is kind of a big deal. …not one but two buckle positions. Right now, the Evenflo Sureride DLX can be found with an MSRP of $85.88, which is a bargain when you consider how long it will likely last. Buy right now on Amazon, and have it delivered right to your door! (Check it Out). When used in the rear-facing position, the weight limit begins at five pounds and after the Evenflo Sureride DLX is used in the forward-facing position, the lower weight limit is five pounds and when switched to forward-facing, the weight limit is 65 pounds, with the height at 54 inches. According to the U.S. Centers for Disease Control and Prevention, the average five-year-old boy is 37.5 – 44.7 pounds and 41.7 – 44.2 inches tall. The average five-year-old girl is 36.3 – 44.0 pounds and 41.3 – 43.8 inches tall. This means that, potentially, your child can still be utilizing the Evenflo Sureride DLX until the age of five. It isn’t a carrier car seat since it is convertible, but compared to the 28+ pounds that some other car seats will be, it makes a difference. You likely won’t be carrying the car seat around with you as you would a baby carrier or anything like that, but you would potentially be moving the car seat from car to car. And that is where it becomes convenient to have a more lightweight car seat. …potentially, your child can still be utilizing the Evenflo Sureride DLX until the age of five. For some, when it comes time to buy a car seat, long before the baby is even born, it can be pretty overwhelming. But even for more experienced parents, finding a car seat can be a challenge. Part of that is because there are always new car seats coming out. But another part of that is because choosing a car seat is a huge deal for your family. The Evenflo Sureride DLX car seat is one of those that grow with your baby, but as many car seats go, it’s not without its faults. It doesn’t graduate to the booster stage of car seats, nor does it support a toddler larger than 65 pounds, but as it stands, 65 pounds is a fair weight limit for a car seat that begins at infancy. And in most car seats, that’s what you want. The longer you can actually utilize the car seat, the better it will be for your bank account and your baby’s comfort.